I participated in a discussion last night about Barack Obama and his prospects for support among Hispanic voters. When I came home and took off my coat, my three-year-old daughter noticed something new on my shirt that hadn't been there before: an Obama '08 button. She asked me a question that exposed the core of my politics these days, and in a few short seconds, I revealed that I am a values voter. Before I get to her question and my answer, I want to hit a couple of caveats. The first is that a "values voter" would ideally look for a candidate to the U.S. presidency who also has some intellectual heft in his toolbox. Obama has that; he not only graduated from Harvard Law, but he was President of the Harvard Law Review, which is one of the top achievements that can be accomplished in U.S. legal education. He is also on leave as a Senior Lecturer at the University of Chicago Law School, which is known for its law and economics discipline. This post is not about the value of a good education, but that factor should not be ignored. Second, focusing on values should not crowd out God himself. Only God can save the country and the world. If we are on the wrong track in any or multiple ways, we first need to turn to God. But God does not work alone. He uses men and women in high places to do great good. That's what is on my mind today and what was on my mind last night when my daughter asked me a simple question. My little angel asked, "Daddy, why do you have that on your shirt?" I said, "Because Obama loves Tía Regina and Tío Mario." It was the simplest expression of my political views in a long time. "Aunt" Regina and "Uncle" Mario are two friends of our family from the Hispanic church we attended for over two years, and my daughter loves and knows them well. As with most of our relationships at that church, we first got to know Regina and Mario as our brothers and sisters in Christ, and only later, through conversations about their lives both past and present, did their visa status (or lack thereof) come up. Their status would not change our fraternal relationship with them. We all saw each others as equals. If we found out that someone we knew could not get a visa (and most who do not have visas in the church could never get one legally, primarily because of poverty), that lack of opportunity was a tragedy but not a basis for approaching them differently. Looking around at the God-loving, otherwise law-abiding congregation, it was nonsensical to me that my government, and many of my fellow citizens, would deem approximately half my fellow churchgoers as unworthy of living among us. So in the context of the current presidential campaign, what drew me to Barack Obama was that his life experience, his statements, and his positions indicate that he sees people in this same way we saw each other in that Hispanic church. Senator Obama isn't the only politician with a perspective that values all immigrants, of course. George W. Bush said in his May 2006 address to the nation on immigration reform that even unvisaed immigrants are "a part of American life," and people of all political stripes have stood up for the common humanity of everyone touched by the immigration bureaucracy. But it is nonetheless true that following the failed legislative proposals of the past couple of years, you will find fewer elected officials taking the endangered stand of principle these days. Few urge us to see immigrants as people first - as neighbors, fellow churchmembers, and fellow residents of this great country. It can be risky for a politician to widen instead of narrow the definition of "neighbor," which was Jesus' charge in the parable of the Good Samaritan. From what I have read of Obama, he has adopted the high ground and has not wavered. Still, when speaking to my daughter, it may have been a stretch for me to vouch for whether a politician "loves" our friends in that church. But on the spur of the moment it was the simplest expression of the quality I find most attractive in him. Over time, Barack Obama has confirmed this impression I have. In his stirring remarks at Dr. Martin Luther King, Jr.'s church in Atlanta earlier this month, he called America to see all immigrants not as enemies but as "companions in the fight for opportunity" (video and transcript here). He marched arm in arm with hundreds of thousands of citizens and immigrants in 2006, saying that "we saw in those marches is the face of a new America" (audio and transcript here). A Nashville business leader who met at length with Obama in 2007 tells anyone who listens that the one federal official in this country who most understands the immigration issue as a human rights and civil rights issue is Barack Obama. You start to get the impression that this man with roots in Kenya and Kansas will never try to define our neighbors away. Martin Luther King, Jr., in his acceptance speech for the 1964 Nobel Peace Prize, called for "an all-embracing and unconditional love for all men." That kind of love is the value that will inform my vote on Tuesday, and it is why I support Barack Obama. Photo by Cindy of Bella Rua Photography. Licensed under Creative Commons. Wow. Powerful stuff, john. I'm bookmarking this post. I too support Obama. For the first time in a long time, I am excited about my vote. He is an inspiration for those of us who have long believed that "experience" in politics or political office is not the catch-all prerequisite for success in office. Lincoln, Eisenhower, Kennedy, and countless other presidents had limited or no executive experience yet became inspirational leaders of our time. Obama has the heart, the brain, and the willingness to work with others that we desperately need after decades of gridlock and party partisanship. Who's values. Certainly not the churches' values. Considering his partial belief in the Holy Bible, he picks and chooses which parts he needs to validate his support for partial-birth abortion. 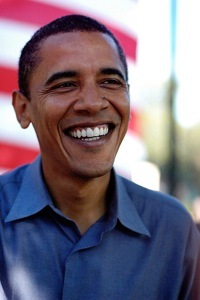 Obama is an old-style populist in new clothes. Tell them enough to make them believe we are on the same page, but not enough that they can pin me down. Mr. Obama has plenty of politcal experience (80% of his professional career), but not the kind that speaks of change. Look beyond his words to his voting record, his unwillingness to take a stand by voting "present." Remember, the people who pay our wages are the ones he wants to raise taxes on. Who then pays the additional costs, us with our jobs and the consumer because of the pass through. Mr. Obama is a very short-sighted man who merely wants to transfer money around to make people think he has really done something. Hugo Chavez used the same message to get into office and all he has done is take money from the "fat cats" and padded his own pockets. On a recent trip to Venezuela, the poor are poorer and the inflation is worse. And is only friends are dictators. Don't make the same mistake as the people of Venezuela who also bought a line, "Si, se puede." I am a white male, interested in finding the "substantial" reasons why Hispanic voters will support Obama. I am very concerned that my Christian Brothers in the Hispanic community are being mislead and used. Mr. Obama has made it clear that he is Pro-choice and Pro Gay rights. This is Anti-Christian. We are called to Love the sinner and hate the sin. As a True follower of Christ, how can you possibly levy a vote for this man? If your primary issue is "what you can get" from the government, I suppose my question answers itself. However, if you are truly concerned about your young daughter, as I am for my daughters, how can you explain to her that you are willing to accept the murder of unborn/partially born babies? I would caution any True Christian to think this through very carefully. Are you teaching your child to stand on God's principles, or on your desire for immigration reform??? As a white male Christian like you, I have a faith in God. Maybe unlike you (and for whatever reason, I'm not making a judgment here), my faith and my passion for immigrant policy are tightly interwoven. Being an American with this passion lets me advocate from the inside for our visaless neighbors who are my friends and brothers and people who are a part of American life. What we are doing via our immigrant policy is setting out an open bear trap in front of millions of families in America, for the purpose of fighting a debatable threat that, even if undisputed, would be disproportionately small compared to the nationwide pain the government is dishing out in my name. As a lawyer, I am particularly sensitive to how our lawmaking and politics impose this injustice on the people around me, and how there are legal solutions that are good and practical but sometimes opposed based only on rhetoric or worse. Combining my profession with my faith, I am drawn to undo the injustice. That is why I care so much about immigrant policy.